First known vineyard growers are ancient Persians, Semitic peoples and Assyrians. The art of vine cultivating came then to the Egyptians, the peoples of Phoenicia and residents of Greece. The Mediterranean is not the only area in which vine gas benn cultivated in this period. From ancient times there are references to wine in ancient China. However, the first wine residue found in container - based on the latest discoveries - in the province of Henan, China aged 9000 years, while the previous finding in Hajji Firuz Tepe in Iran were aged 7000 years, and the immediately previous from this, the same region were aged 5100 years. The Phoenicians are considered one of the best winemakers of antiquity. They found Phoenician amphora wine storage throughout most of eastern and central Mediterranean. Tyre was one of the largest centers of maritime wine trade. Ancient Egypt had a love-hate relationship with wine. Given Egypt’s minimal capability to grow grapes, with only a few sections of Egypt (like the Nile Delta) capable of cultivating such a crop, most wine was imported into Egypt. Thus for much of ancient Egyptian history both local and foreign wines were considered elite, and were therefore used only for ritual purposes or drunk by the uber elite and royal family (who, along with the temples owned most of the vineyards); with the exception of festivals like that of Hathor in Bubastis, where it was common for all people to be given free wine courtesy of temple lands. With wider trade routes and greater technological expansion, by the middle of the first millennia BCE however, wine had spread from temple and elite consumption to the wider masses and was, of course, wildly popular. Wine was a popular grave good among the wealthy echelons of Egyptian society because it was, of course, something they wanted to take with them to drink and be merry with in the afterlife. Most wine in ancient Egyptian society was red wine, which was known as irep. A sweetened red wine, used more often for ritual purposes and drunk by the Pharaoh was called shedeh. With the discovery of white wine in King Tut’s tomb it is believed that it, too, was popular in the religious efforts of Egyptian high society, particularly for ritual purposes and as a grave good. Prior to the discovery of white wine in King Tutankamun tomb, white wine was not believed to have been around in Egypt until the first century BC, when vineyards producing whites are mentioned near Alexandria by Roman authors. If white wine was around for the two thousand or so years prior to their written inclusion and only appear the once on behalf of King Tut, it would appear that it must have held a particularly elite role within Egyptian society, perhaps even being a sacred wine of the temples which was rarely released to even the highest stratum of society. 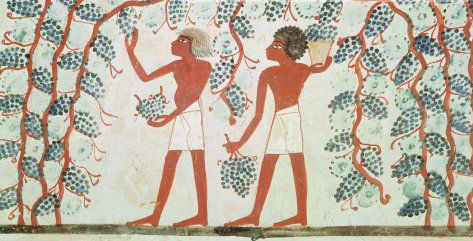 Egyptian tomb painting depicting grape cultivation, around 1400 BCE. Image courtesy the Metropolitan Museum of Art. The similarity of appearance between red wine and blood in particular disturbed the Egyptians and added to its mythical power within their society. To drink it was to drink the blood of the earth. Early cults among the Delta, dedicated to deities later known more commonly as Osiris, Isis and Seti, most likely used wine in their ceremonies and offerings, believing their gods to be rather vampiric in nature and that the wine might stand in for human sacrifices (a concept Anne Rice explores rather marvelously as the origin myth for her literary Vampires). Wine continued to be an offering to the gods of the earth in later, brighter periods of Egyptian culture and was, particularly associated with the blessing of crops and vineyards. In the Moralia the later Roman author Plutarch mentions a particularly intriguing period of Egyptian history circa 60 BCE when the superstition regarding wine as blood had become so fervent among the Egyptian people that even the royal family ceased its consumption, believing it to be not just the blood of the earth, but the blood of the enemies of the gods whose bodies had swallowed by the grave. Naughty blood nobody wanted to drink and have be a part of them.